We’d love your help. Let us know what’s wrong with this preview of Beating Back the Devil by Maryn McKenna. IN THE WAR AGAINST DISEASES, THEY ARE THE SPECIAL FORCES. They always keep a bag packed. They seldom have more than twenty-four hours' notice before they are dispatched. The phone calls that tell them to head to the airport, sometimes in the middle of the night, may give them no more information than the country they are traveling to and the epidemic they will tackle when IN THE WAR AGAINST DISEASES, THEY ARE THE SPECIAL FORCES. They always keep a bag packed. They seldom have more than twenty-four hours' notice before they are dispatched. The phone calls that tell them to head to the airport, sometimes in the middle of the night, may give them no more information than the country they are traveling to and the epidemic they will tackle when they get there. They are the disease detective corps of the U.S. Centers for Disease Control and Prevention (CDC), the federal agency that tracks and tries to prevent disease outbreaks and bioterrorist attacks around the world. They are formally called the Epidemic Intelligence Service (EIS) -- a group founded more than fifty years ago out of fear that the Korean War might bring the use of biological weapons -- and, like intelligence operatives in the traditional sense, they perform their work largely in anonymity. They are not household names, but over the years they were first to confront the outbreaks that became known as hantavirus, Ebola virus, and AIDS. Now they hunt down the deadly threats that dominate our headlines: West Nile virus, anthrax, and SARS. 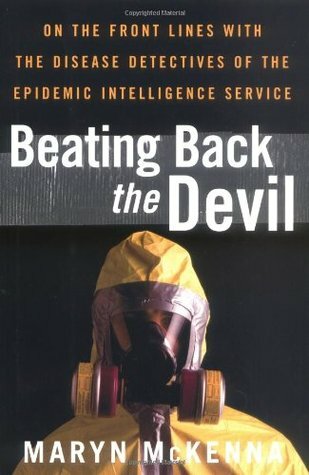 In this riveting narrative, Maryn McKenna -- the only journalist ever given full access to the EIS in its fifty-three-year history -- follows the first class of disease detectives to come to the CDC after September 11, the first to confront not just naturally occurring outbreaks but the man-made threat of bioterrorism. They are talented researchers -- many with young families -- who trade two years of low pay and extremely long hours for the chance to be part of the group that has helped eradicate smallpox, push back polio, and solve the first major outbreaks of Legionnaires' disease, toxic shock syndrome, and "E. coli" O157. To ask other readers questions about Beating Back the Devil, please sign up. For two days I have done very little except read this book. I thought it was going to be dry, but interesting talking objectively of the work of the Centers for Disease Control (CDC) and various other government organisations dealing with mass outbreaks of disease and germ warfare. But I was wrong! It was anything but dry. A fabulous read. Travel, adventure, humour, mystery, plot twists, interesting characters, it really had it all. The best of the mystery stories was when four babies died of li For two days I have done very little except read this book. I thought it was going to be dry, but interesting talking objectively of the work of the Centers for Disease Control (CDC) and various other government organisations dealing with mass outbreaks of disease and germ warfare. But I was wrong! It was anything but dry. A fabulous read. Travel, adventure, humour, mystery, plot twists, interesting characters, it really had it all. The best of the mystery stories was when four babies died of listeria, a gut disease that can take up to four weeks to show. The CDC had to track down how the babies caught it which involved finding the victims of the present infection typing this particular listeria so it could be differentiated from other outbreaks. The next step was interviewing a massive number of people, both those who had it and a control group.. Then their fridges had to be gone through, stores and delis where they bought items that could be infected had to be inspected, the managers and buyers interviewed and this was in several different states. Once the source had been narrowed down to pre-cooked, sliced turkey, the source had to be identified through interviews with the vendors and thence to the turkey meat manufacturers. They reacted really well recalling all possibly infected turkey at a great financial loss to themselves. It made me wonder if there isn't insurance for this kind of event. Eventually, the source of infection was closed down and there were no more cases. The plot twist? The four babies who had died and started the investigation had not had this particular listeria at all! The book ranged from 9/11 through anthrax, SARS, polio, tuberculosis, pneumonia, AIDS and more not just in the US, but Africa, South America and Asia. An interesting fact I learned was that although it is known that smallpox has been kept alive in both legal labs and in those who might wreak germ warfare on the world, only people who might have contact with it are vaccinated. This is because although there were very few major reactions to the vaccine - a sore arm and slight fever being common and only lasting a few days (I had them) - about 7 or 8 children per million vaccinations would die from complications. Now there was so little need for the vaccine, it's use was abandoned. It is ten months since two hijacked planes brought down New York City’s World Trade Center, and nine months since a set of mailed envelopes, loaded with finely milled anthrax, accomplished the first fatal bioterrorist attack in American history on American soil. There were earlier fatal bioterrorism attacks in America. Smallpox was used as a bioweapon by British forces to subdue Native Americans during the French & Indian War (1754 - 1763). See Jeffrey Amherst and Smallpox Blankets and this New Scientist article, British used bioweapon in US war of independence. According to Jonathan Tucker, former biodefence expert, the British also used smallpox against American troops during the American Revolutionary War (1775–1783). See Pox Americana: The Great Smallpox Epidemic of 1775-82 and the New Scientist article linked above. This is a book about the Epidemic Intelligence Service, the "disease detective corps" of the Centers for Disease Control and Prevention. For three weeks, Ph.D.s, nurses, doctors, veterinarians, dentists, and even lawyers are trained in epidemiology and public health. They are put through a rigorous class schedule, frightening simulations, and even yanked out of classes to deal with disease outbreaks. Once they are fully trained, they spend two years working where-ever they are needed. Their work This is a book about the Epidemic Intelligence Service, the "disease detective corps" of the Centers for Disease Control and Prevention. For three weeks, Ph.D.s, nurses, doctors, veterinarians, dentists, and even lawyers are trained in epidemiology and public health. They are put through a rigorous class schedule, frightening simulations, and even yanked out of classes to deal with disease outbreaks. Once they are fully trained, they spend two years working where-ever they are needed. Their work is multi-pronged: they go door-to-door, interviewing every contact of an infected person; they use molecular biology to pin down which cases of a disease are involved in an outbreak; they reassure the public. Sometimes they are assigned to work in a state, coordinating and investigating. But with only days or even hours notice, members of the EIS fly into war-torn countries to work with refugees, into politically charged anthrax investigations, to Listeria outbreaks afflicting a trailer park. They must be prepared for any situation. This is a very exciting book! McKenna splits the chapters between the culture and training of the EIS (they have to wear full military uniform every Wednesday, for instance), and their investigation of disease outbreaks. Both are fascinating, but hampered because McKenna insists on writing a full paragraph about the family and professional life of every person mentioned, no matter how tangential. A better book would have focused on a few people, or cut out the sentences about their build and how many children they have. OK, now I'm not quite sure how any of us ever live past 35. This book was fascinating, terrifying, informative, etc. Pretty amazing to hear about the experiences of CDC officers and the projects they work on and how. It was a little bit difficult to keep track of all the different people mentioned and followed in the book, but I kind of just didn't worry about exactly who everyone was and tried to focus on the rest of what was going on. Also, it was kinda mindblowing how many of these epidemics I OK, now I'm not quite sure how any of us ever live past 35. This book was fascinating, terrifying, informative, etc. Pretty amazing to hear about the experiences of CDC officers and the projects they work on and how. It was a little bit difficult to keep track of all the different people mentioned and followed in the book, but I kind of just didn't worry about exactly who everyone was and tried to focus on the rest of what was going on. Also, it was kinda mindblowing how many of these epidemics I remember, but not very strongly - many of the big outbreaks discussed in this book happened between my late teens and when I finished college. Obviously, I remember the anthrax thing with the postal system - anyone who lived through 9/11 likely remembers that one. I remember when everyone was talking about the bird flu. I remember hearing about West Nile and MRSA and SARS, and I remember knowing they were serious and knowing there were travel or blood donation restrictions and that kind of thing, but I never knew 90% of what this book describes about each one. The one I felt I knew the most about was listeria, which I really didn't know much beyond pregnancy restrictions associated with listeria - I knew it was foodborne and I knew which foods it travels in because they're the pregnancy restrictions, so the listeria chapter was kind of a "pregnancy restrictions extended version." I guess if the book had been written later, it would probably have had a chapter on zika, too. I felt awfully grateful that smallpox is gone, after hearing the descriptions of that. Yikes. I did not finish this book so these are my thoughts only about two-thirds of it. Parts of it were really interesting, and parts were rather boring. It was interesting to read about the struggles these doctors faced while living in India and struggling to eradicate smallpox. It wasn’t so interesting reading about the rather mundane struggles they faced living in Atlanta and trying to balance careers and parenting. It was interesting reading about their learning to dress safely at a contaminated I did not finish this book so these are my thoughts only about two-thirds of it. Parts of it were really interesting, and parts were rather boring. It was interesting to read about the struggles these doctors faced while living in India and struggling to eradicate smallpox. It wasn’t so interesting reading about the rather mundane struggles they faced living in Atlanta and trying to balance careers and parenting. It was interesting reading about their learning to dress safely at a contaminated scene. It was not so interesting being told about their learning to adjust to a uniform. One thought about the organization of this book. I found it a little odd. It discusses numerous disease outbreaks from about the 1920s on. But instead of going chronologically, it jumps back and forth. So she will tell us about something that happened in 2001 and then jump back to 1950, then in 2005 and jump back to the 1960s, and so on. She gives us enough history about each outbreak to not really be lost in the timeline, but it was unusual. Because of the nature of work needed to be done by these epidemiologists, and the diseases they had to combat, several chapters discussed the homosexual lifestyle. It was done as delicately as possible but was more than I was comfortable reading. Because I was just reading it for my own information, and not from a need to know, that was the reason I quit reading. This is a fascinating look at the work done by the CDC's disease detectives. Good summary of previous outbreak investigations conducted by EIS officers. I learned a lot. However, it was written in quite a sensational nature. I don't think that public health work is ever quite as flashy! I'm a medical interpreter so this book is right in my sweet spot - disease! International locales! Shoe-leather epidemiology, oh my! The officers of the EIS track down diseases, figuring out where they hide and what makes them spread. It can be exciting but a lot of it is good ol' detective work - gathering data, analyzing trends, tracking down leads. We watch the officers do their thing in LA, Malawi, and beyond. A wide range of diseases are covered, from malaria to SARS. I was drawn to outbreaks I'm a medical interpreter so this book is right in my sweet spot - disease! International locales! Shoe-leather epidemiology, oh my! A wide range of diseases are covered, from malaria to SARS. I was drawn to outbreaks that I knew existed but had only a basic idea how they started - polio, AIDS, West Nile. The medical information is easily digestible and relatively jargon free. I listened on audio and I'm not sure it was the best way to enjoy this book. I didn't click with the narrator (weird pauses, mispronouncing some medical terms) and would have probably enjoyed the words more if they were on a page. The library only had the audio version though, so whatevs. A very informative account of the work of the EIS division of the CDC. It describes several major health crises where the CDC stepped in and goes into illuminating detail about what its investigators do. Most of these were epidemics that appeared in the press but you'll learn a lot more about them here. The author also documents the way that the US Public Health Service was militarized by a Bush appointee in a way that makes no sense at all. The scientists were forced to wear uniforms at all tim A very informative account of the work of the EIS division of the CDC. It describes several major health crises where the CDC stepped in and goes into illuminating detail about what its investigators do. The author also documents the way that the US Public Health Service was militarized by a Bush appointee in a way that makes no sense at all. The scientists were forced to wear uniforms at all times and were rejected from serving if they couldn't meet military physical fitness standards. Diseases are fun! This book probably gave me the idea to want to become and epidemiologist. I read it during the summer while waiting for my dance class... It's always fun going from epidemics to ballet. Non-fiction books have a bad reputation of being boring. This book wasn't. It was almost like an anthology of different mysteries. True mysteries... with diseases! This is the sort of work I would be doing if I were ten times as ambitious, but just as cool. Beating Back the Devil was an interesting read; I'd never even heard of the EIS before picking up this book on a recommendation (I believe the Slate Gabfest mentioned it). The chapters provided a lot of detail on how various outbreaks played out, many of them I'd only heard about in a cursory way while I was growing up, such as the anthrax scare and SARS. Somehow I'd never understood the scope of these outbreaks before, nor how direct and intensive the CDC's involvement was in combatting them. I Beating Back the Devil was an interesting read; I'd never even heard of the EIS before picking up this book on a recommendation (I believe the Slate Gabfest mentioned it). The chapters provided a lot of detail on how various outbreaks played out, many of them I'd only heard about in a cursory way while I was growing up, such as the anthrax scare and SARS. Somehow I'd never understood the scope of these outbreaks before, nor how direct and intensive the CDC's involvement was in combatting them. I will say, I almost skipped this book after reading some of the other reviews here. In the chapter on tuberculosis the author conflates cross-dressing, homosexuality, and transsexuality using blanket terms that revealed a real lack of understanding. The TB chapter and the entire bit about uniforms were easily the weakest parts of the book, while I understand why the author might've felt the need to include them, they seemed incongruous with the rest of the book. Material: 5, Writing: 2, overall 3.5. This is a great read about the CDC and more specifically about its Epidemic Intelligence Service (EIS) members who are the health care specialists that track down diseases around the world to help stop their spread & find a cure. The one major flaw in the book is that the writing has all the charm & verve of a paper bag; it is cut dry, bland, and almost sleep inducing. Luckily, the stories about different EIS endeavors are fascinating by themselves t Material: 5, Writing: 2, overall 3.5. I heard about this book from a Podcast that I listen to. They had an episode on the Measles epidemic that is going on. "Beating Back the Devil" was published in 2004, about 15 years ago. As a germ freak, I was scratching myself from phantom itches as I was reading this book. This book had concrete information on all outbreaks that we had in the past. I have a friend that works for CDC. Whenever we meet up, I always cringe on what she is going to tell me to look out for. There are some things tha I heard about this book from a Podcast that I listen to. They had an episode on the Measles epidemic that is going on. "Beating Back the Devil" was published in 2004, about 15 years ago. As a germ freak, I was scratching myself from phantom itches as I was reading this book. This book had concrete information on all outbreaks that we had in the past. I'd rate this 3.5 stars if I could - it's interesting, but I think it lacks a cohesive narrative even though the author does her best to construct one and make the characters relatable on a personal level. I love reading about epidemics, but it was a little frustrating that some of the ones in this book weren't covered very in depth while others were much more detailed. Maybe that was the point, to look at the breadth of what the EIS does, but it felt a little scattered. A gripping account of the heroic actions of the CDC's Epidemic Intelligence Service - and a good companion to Mark Pendergrast's "Inside the Outbreaks." The author unfortunately seems confused about the difference between transsexual and transvestite, however, or else fails to articulate the distinction clearly. Fascinating read. Each chapter covers a major case and follows the epidemic through to its conclusion. The only drawback is that it needs updating. The chapter on the 2001 anthrax attack still assumes the case to be unsolved, and the book would benefit from an additional chapter on the Ebola outbreak of 2014. This book was amazing. I was not aware of the existence of the EIS prior to listening to the author talk on NPR. This book talks about the timelines of several epidemics and the role played by the EIS detectives during these events. I enjoyed learning about the methods and the techniques that they used to track the cases and detect the source of the epidemics. A must-read. The portions of this book that focused on the epidemics were very interesting. The parts that focused on the people involved were less enjoyable. The descriptive style would've been more at home in a YA novel.